The Atlantic white-sided dolphin was only recognized as a separate species in 1846. Earlier finds remain unclear because they were sometimes confused with bottlenose (Tursiops truncatus) or common dolphins (Delphinus spp.). Atlantic white-sided dolphins are large and robust animals with a short thick snout grading smoothly into the forehead and a tall curved dorsal fin. They are more colourful than most other dolphins: the back, flippers, fluke and the dorsal fin are black, the sides are lighter grey and a white patch on the side extends from below the dorsal fin and continues toward the tail. The thick tailstock has a striking yellow band. Males can reach a maximum body length of 2.7 metres and a weight of 230 kg. The number of dolphins observed in a group varies from a few individuals up to several hundred but typical inshore groups around the British Isles contain less than 10 individuals. Atlantic white-sided dolphins feed opportunistically on schooling fish (herring, mackerel, smelt and gadid fish as well as squid). Recent analyses of stomach contents indicate that their prey varies depending on their location and the time of year. Atlantic white-sided dolphins inhabit the cold-tempered North Atlantic. Conducting censuses of oceanic dolphins is really challenging, requiring extensive surveys. Estimates for the western Atlantic total about 40,000 individuals, including the northern part of the North Sea. 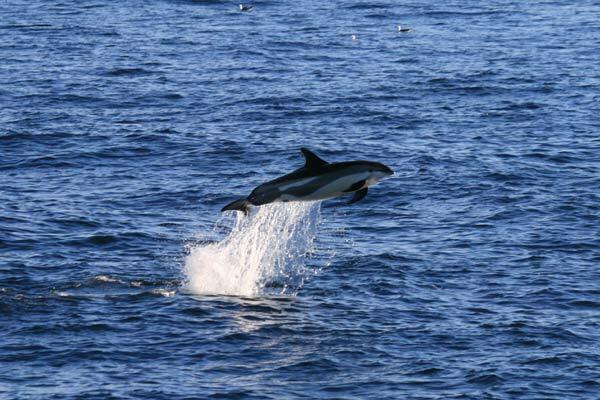 The SCANS II Project estimates about 12,000 individuals for the ASCOBANS area but may be somewhat inaccurate due to confusion with white-beaked dolphins in aerial surveys. The species is currently not hunted, although historically many were killed in fisheries in Norway, Newfoundland, Greenland and the Faroe Islands. Incidental entanglement in fishing gear occurs regularly in mid-water and pelagic trawl nets. Pollution and underwater noise are of additional concern. Northern East Atlantic Poor 833 (SCANS Survey)* Project Report: Review of Trend Analyses in the AS [more] The population size estimate is based on data collected during SCANS-II (2005) and CODA (2007) surveys. See the previous Trend Analysis document for more details. SCAN-II and CODA reports can be found in the additional notes section. *Note: the estimated population incorporates both Atlantic White-Sided Dolphins and White-Beaked Dolphins sightings. There are no separate estimates for this region. This data was collected during the SCANS survey. Northern North Sea Poor 1,905 (SCANS Survey)* Project Report: Review of Trend Analyses in the AS [more] The population size estimate is based on data collected during SCANS-II (2005) and CODA (2007) surveys. See the previous Trend Analysis document for more details. SCAN-II and CODA reports can be found in the additional notes section. *Note: the estimated population incorporates both Atlantic White-Sided Dolphins and White-Beaked Dolphins sightings. There are no separate estimates for this region. This data was collected during the SCANS survey.